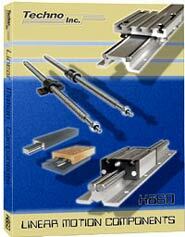 If you know the catalog number please get the exact page number from the "Product Index"
If you know the name of the product please refer to the "Alphabetical Index"
This new 144-page master catalog H860 features over 1,080 linear motion components for all types of automation. These items are linear rails, bearings, acme and ball screws, ball and cross roller slides, aluminum structural profiles and table plates. Applications include drilling, inspection, dispensing, soldering, laser scanning, test stands and any in-house automation project. These components make it more affordable to design, build or repair linear motion systems. of carriages. One model of note is the Series 300 Rail and Carriage. It has a 90mm wide base allowing it to handle higher cantilever loads at speeds up to 10 meters per second. Techno-Isel will also be marketing a line of THK Caged BallTM Technology LM Guides. They will be available from stock and our application engineers will be ready to assist in the selection of LM Guides for your application. A complete line of acme and ball screws is offered in inch and metric sizes in lengths to three meters. The 16mm diameter ball screw is offered with finished ends in 2.5, 5, 10 and 20mm leads. The KM series nut is only 28mm in diameter and can be preloaded to meet the most demanding applications. Ball and cross roller slides come in travels from 0.5" to 12" and loads from 1.5 to 2032 lbs. Lastly, an entire section is devoted to structural aluminum profiles and table plates. These plates come as wide as 375mm and 3 meters in length. They are Ideal when putting together a work platform for a flexible manufacturing cell. From the table of contents below, you can view the catalog page by page in either PDF or HTML. In order to view the PDF files, you will need a copy of Adobe's Acrobat Reader. To download a free copy of Adobe Acrobat PDF Reader, click here. 100 KM Series Anti-Backlash Ball Nut - Metric, 25 mm dia. 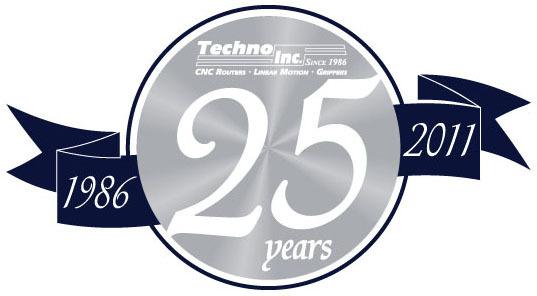 Name of Division or Subsidiary: Techno Linear Motion Components, a subsidiary of Designatronics, Inc. Techno provides their web sites, products and services to you and your employer subject to the following Terms and Conditions of Sale. Your use of a Techno's web site indicates agreement by you and your employer to these Terms. As used herein, "Seller" means Techno Linear Motion Components, "Buyer" means any person ordering goods from Seller after March 31, 2006, and "person" means any individual, corporation, company or other entity. You authorize the placement and use of "cookies", software or data on your information systems in connection with your use of this Website. PASSWORD SECURITY: You will keep any password or similar code for a Techno web site secret and you will not allow any other person to use your registration or password for a Techno web site. You will be responsible for any and all damage arising from the use of your registration or password by another person. Office hours are 9AM-5PM, EST, Monday-Friday. You may fax (516) 358-2576 or email http://www.techno-isel.com/tic/Support_Mail_Comp.htm at any time. When ordering, specify part numbers, quantities, desired delivery date and shipping method. For larger production quantities, Seller will provide written quote of price and delivery on request. Seller will provide current price/stock status on any catalog item by telephone or fax request. Quotes for modified catalog parts or custom-made parts are available on request. Please send sketches or prints. MINIMUM ORDER: From USA, $50 + freight. From outside USA, $75 + freight. There is an additional charge of $10 for orders below the minimum. There is $10 + freight minimum for E-Commerce on-line orders from the USA and from outside the USA, $25 + freight minimum order. PRICES: Prices shall be as in effect at time of purchase order or as agreed to in writing by Seller. Prices listed in its catalog or elsewhere are subject to change without notice. Please contact Seller to confirm price. Prices do not include freight, duties, special handling, certification, insurance or taxes, which are all Buyer�s responsibility. CREDIT: Bank and 3 trade references are required for new accounts. Until account is approved, Seller may require cash in advance, payment by approved credit card or C.O.D. C.O.D. orders are subject to an additional handling charge. TERMS: For open accounts, terms are net 30 days, F.O.B. our plant. Open accounts are invoiced for goods/freight when shipped. Seller accepts VISA�, MasterCard�, American Express� and Discover�. Buyers paying by credit card are charged for goods/freight when shipped, subject to credit card approval. All past due amounts shall bear interest at one and one-half percent (1.5%) per month or the highest legal rate, whichever is less; and Seller may recover all costs, including attorneys� fees, incurred to collect any past due amount. SHIPMENT; RISK OF LOSS: Seller will ship goods as directed by Buyer or determined by Seller, usually UPS, DHL, FedEx, in any case at Buyer�s cost. Seller will endeavor to meet promised delivery dates. Buyer shall bear all risk of loss and damage after goods are delivered to carrier, including any loss or damage in transit. For shipments outside of the USA, the Seller's policy to only ship via UPS unless the Buyer supplies their freight collect account number. RETURNS; EXCHANGES; SHORTAGES: Buyer must get return authorization in writing. Seller must approve returns and exchanges in writing. Returns must be requested within 15 days after receipt of goods. Returned goods will be inspected and a restocking charge may be made. No credit will be allowed on custom-made, used or modified parts or parts purchased on a quantity basis. Shortages must be reported within 10 days after receipt; and if so reported, Seller will make up shortages at its cost. TECHNICAL AND PRODUCT INFORMATION: Seller disclaims responsibility for errors or omissions in any technical or product information contained in its catalogs or other sales materials. Buyer is solely responsible for determining if goods are suitable for purposes intended by Buyer and its customers and future users. (iii) damaged during or after transit, (iv) used or incorporated with or into any other product, machine or equipment after Buyer or anyone using the goods has, or reasonably should have, knowledge or the defect or non-conformance, or (v) manufactured, fabricated to assembled by anyone other than Seller. ALL OTHER WARRANTIES, EXPRESSED OR IMPLIED, INCLUDING IMPLIED WARRANTIES OF MERCHANTABILITY AND FITNESS FOR PARTICULAR PURPOSE, ARE DISCLAIMED. BUYER�S REMEDIES: At Seller�s option, if it breaches the warranty set forth above, it may either (a) repair or replace defective or non-conforming goods or parts or (b) repay the price it received for goods, whichever it elects. As a condition precedent to either remedy, Buyer shall have paid the price of the goods and made them available for inspection at Buyer�s place or business or returned them at Seller�s request and cost and by the carrier it designates. BUYER SHALL HAVE NO OTHER REMEDY AGAINST SELLER, AND ALL OTHER REMEDIES ARE WAIVED, INCLUDING ANY RIGHT TO RECOVER CONSEQUENTIAL OR INCIDENTAL DAMAGES. The limited warranty set forth above and these remedies shall extend only to Buyer and not to any subsequent buyer or user of the goods. In no event shall Seller�s liability for breach exceed the price paid for by the goods by Buyer. GOVERNING LAW; EXCLUSIVE JURISDICTION: This contract shall be governed by the substantive laws of New York, without regard to choice of law principles. The State and Federal courts in Nassau County, New York, shall have the exclusive jurisdiction and venue to adjudicate rights and duties under this contract. PERIOD OF LIMITATIONS: An action for breach of this contract, including breach of the limited warranty set forth above, or any other action relating to goods shipped by Seller or ordered by Buyer, must be commenced within one (1) year after the cause of action accrued. MISCELLANEOUS: All orders placed with Seller after March 31, 2006, constitute acceptance of these Terms and Conditions. All conflicting, inconsistent and additional terms and conditions are rejected unless contained in writing and signed by an officer of Seller. Buyer may not assign any rights or remedies under this contract without Seller�s prior written consent. If any part or provision of these Terms and Conditions is held to be invalid or unenforceable, such part or provision shall be deemed omitted, and that shall not affect the validity or enforceability of any other part or provision hereof.